Structural engineers design buildings and other structures to resist a wide variety of forces. The different types of forces include the mass of the contents of the structure including the structure itself; transient forces from the occupancy of the structure (i.e. people moving inside the structure, equipment operating inside the structure, etc…); and environmental forces such as wind, earthquake, snow and rain. Certain structures may be required to withstand impact forces such as from blasts or missiles. Steel has evolved over the last 100+ years to be a widely used material in structures. The availability, economy, high strength to weight ratio, ductility and elasticity are just a few factors that make steel such a popular building material. However, steel does have several disadvantages that must be taken into consideration when designing a structure. Shear failures will typically occur in connections between members (i.e. member to column connection, member to girder connection, etc…). Designing a connection is not an easy task. Connections typically have high shearing forces that an engineer must consider when designing the connection. A failure can occur if the structural engineer underestimates the design force the connection is to withstand. 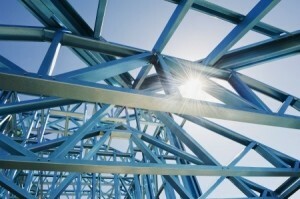 Common connections in steel structures may be made with bolts or welds or a combination of both. Flexural failures occur in flexural members such as members and girders, and, in some cases, compression members such as columns that are subjected to bending stresses. Flexural members typically fail when flexural loadings cause the element to buckle. Because steel is strong, steel members are designed to be slim and efficient which may put them at risk of buckling. Heavier, stocky members are less susceptible to buckling. Flexural loadings create tension and compression forces in members. Lateral torsional buckling occurs when the high compression forces causes an unrestrained section of the member to buckle and laterally displace. Providing lateral restraint to a member helps ensure it will not buckle. However, a member may still fail should the stresses resulting from a flexural loading condition exceed the material strength of the member. Compression failures typically occur in compression members, such as columns and braces, when the compressive axial force applied to the element caused the element to either buckle or become overstressed. Similar to beams, column and brace members subjected to high compressive stresses may experience buckling. A consideration to take into account when designing a column is its slenderness ratio (ratio of cross sectional geometry to length of member); a member with a high slenderness ratio is more susceptible to buckling than one with a lower ratio. Members with low slenderness ratios may still fail when the compressive stresses exceed the material strength of the member. Tensile failures generally occur in brace members or hangers. This type of failure occurs when the steel member is stretched to a level that exceeds the material strength of the member. This occurs in stages, the first being yielding, necking and then the material fails at the point with the least cross section area. Steel is a very strong material and very reliable in structural construction of buildings. Its effectiveness, however, is only guaranteed when the steel is properly designed to withstand the imposed forces. Poor design can lead to the above-mentioned failures of steel structures. Do you have more questions after reading this article? Don’t wait – contact a team member of Structural Innovations today!